One item I knew I was going to need in this house was additional storage outside of my kitchen. Because my house was built in the 1930’s, it doesn’t have a pantry – just a few kitchen cabinets to fit my dishes, cups, dry goods and spices, and four drawers to place cooking sheets, pots and pans, and baking equipment. Needless to say, I do NOT have room for liquor in there! 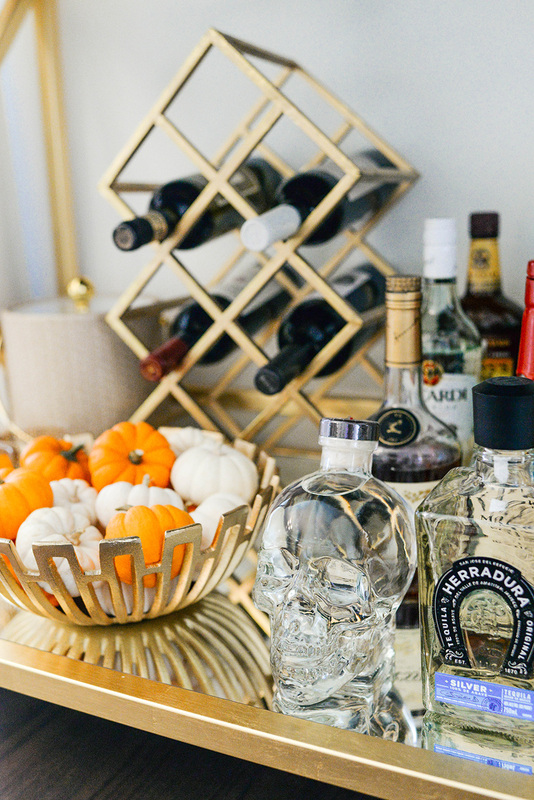 A bar cart is a great way to add a luxe touch to your dining or living area, while providing great storage for bigger liquor bottles, wine, bar tools and special occasion glassware. 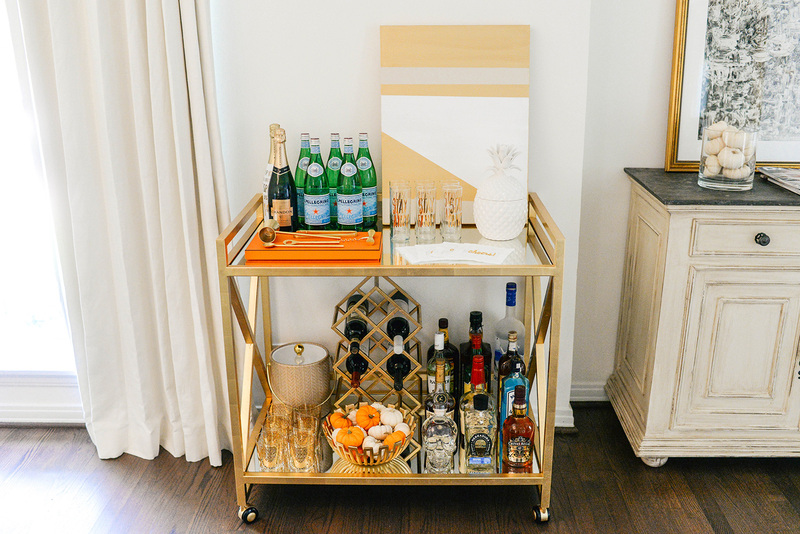 I’d been eyeing this stunning gold bar cart on Mintwood Home for awhile, and since the holidays are coming up I wanted to go ahead and get it up and running. I’m SO glad I chose this style. The gold leaf finish ties into the white and gold theme I have going on in my dining and living areas, and it’s simple silhouette and design give it endless styling possibilities! I love being able to add color depending on the occasion, for example, I’ve gone ahead and styled it for Halloween since it’s now October. Once we’re past that, I may switch out the pumpkins for some pinecones or something more Christmas-y! In the spring, lemons and limes would be a great option too. 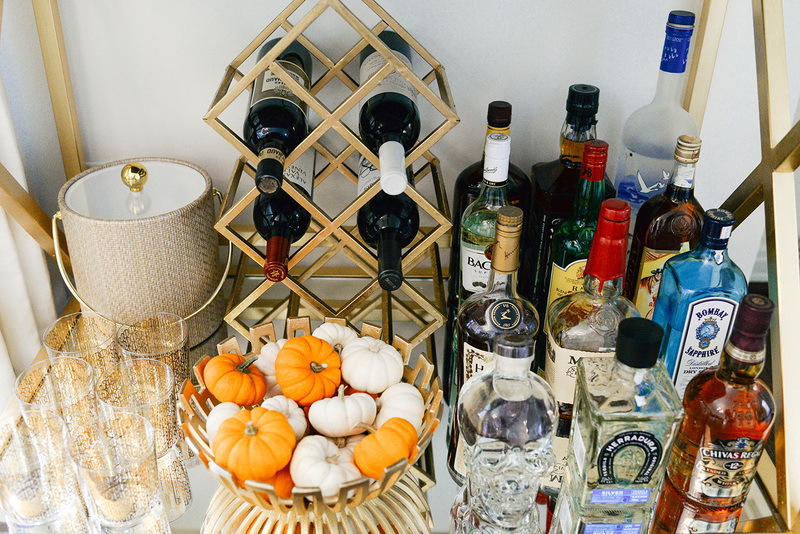 Luckily this bar cart is tall, because I have some pretty tall bottles and decided to pick up a little wine rack for additional storage on the bottom level. It’s perfect! So not everything was bold gold, I wanted to choose some pieces that would add texture and functionality to the cart. I decided on this pretty ceramic pineapple, which could easily function as a flower arrangement, or is a fab place to store matches, candy, mixed nuts and other little things like that. For additional texture, I grabbed this wicker ice bucket which pulls out the neutral hues in my sister’s painting up top. 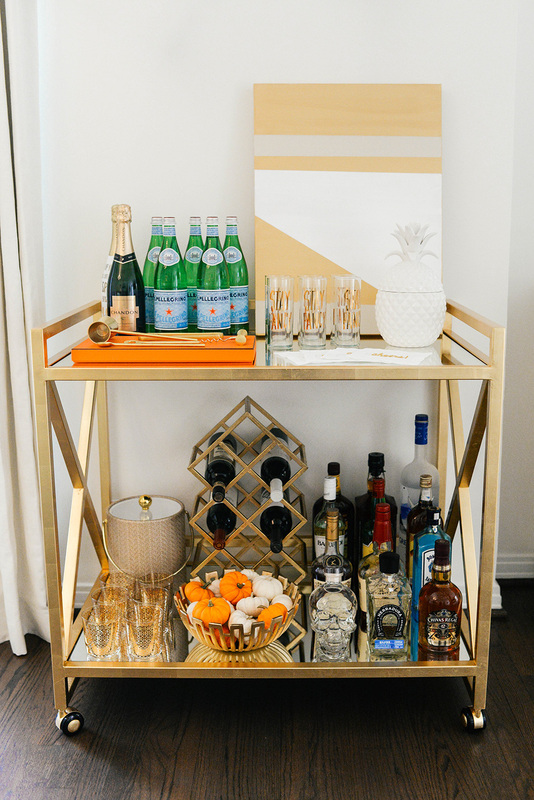 It all comes together to make a gorgeous, cohesive bar cart, don’t you think? It’s nice to have ice on hand so you don’t have to go back and forth from the freezer. 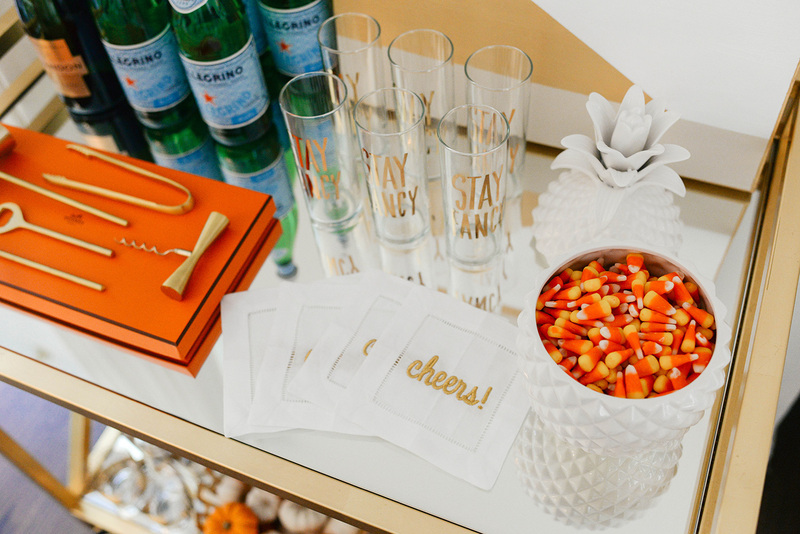 For some smaller gold touches, I went with accented glassware with these Stay Fancy glasses. Darling! 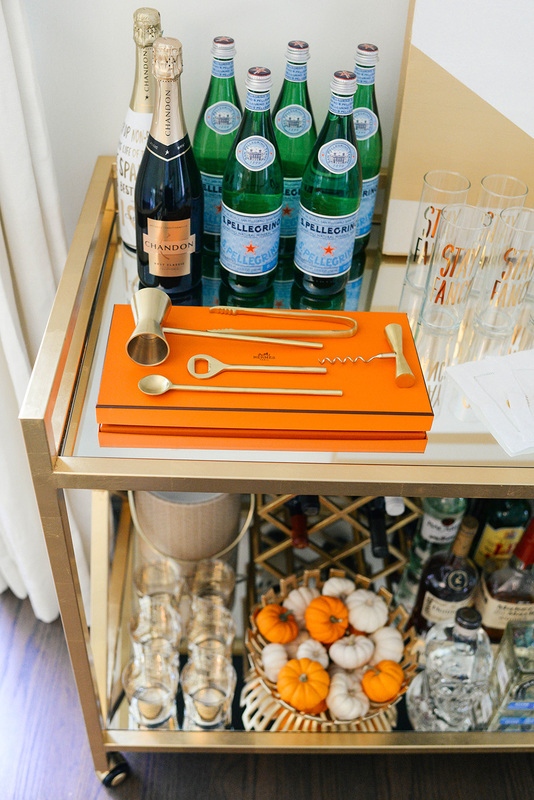 Perfect for any cocktail. I’ve got a set of vintage-looking gold tumblers down below as well for those who prefer a highball glass. 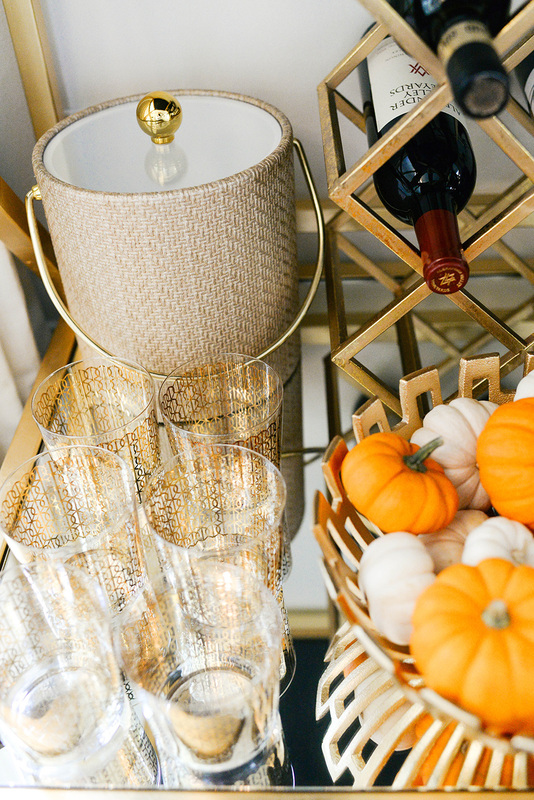 I was looking for a way to display my pretty gold bar tool set on here, and remembered I had an Hermes box from that scarf I purchased last year – it adds a punch of bright color and goes well with the pumpkin bowl this month! This simple end table is under $200 and would be the ideal accent between a pair of chairs in your living area! This ceramic lamp has a gold bottom just like mine do on my nightstands! A modern touch to any side table, desk or chest! Sleek and sophisticated, this gold coffee table with a glass top would look amazing in any space. I recently picked up an object similar to this as an accent to my etagere in the office, and it’s such a fun piece! 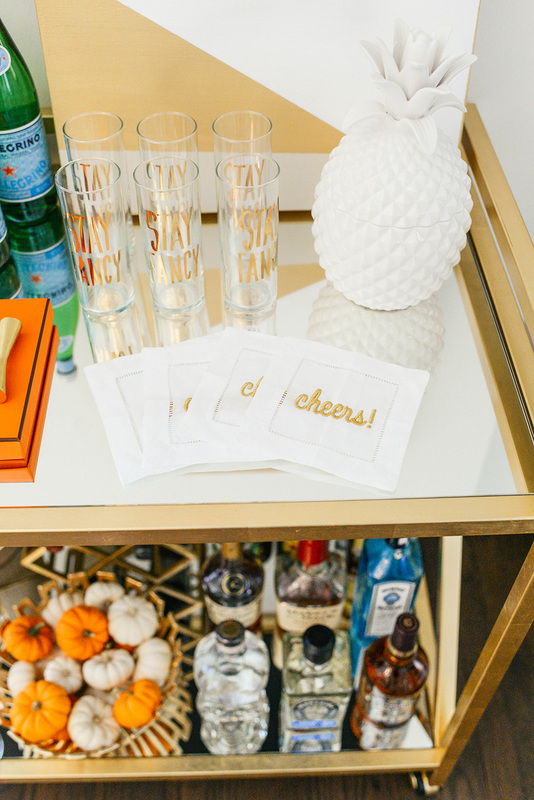 If you’re looking to jazz up your coffee table or bar cart, might I suggest these mirrored trays? So pretty! 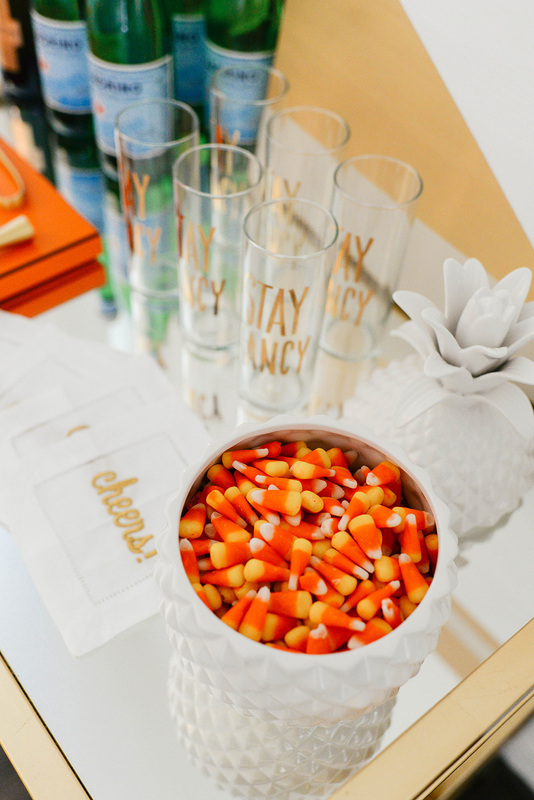 This acrylic tray is a less expensive option you can customize – great gift idea! If I didn’t have so much gold going on already, I would’ve purchased these tumblers. Too cute! Talk about GLAM. This chandelier is incredible. So dreamy! I bought the 2×3 size of this rug to use as an entry mat in my kitchen and it looks perfect against the grey paint in the room! How cute is your bar cat! I love the set up too!